Benefits of riding a bike are known to every sensible person. If you have a medical condition and you are advised to exercise, biking can help you to keep physically active. Besides that, you can also use it to save money without paying excessive bus and train fares. There are different kinds of bikes to suit each situation such as regular road bikes for riding fast on a smooth path, mountain bikes for steep and rocky surfaces as well. Different manufacturers offer different features to the riders as benefits. But you may never get the sparks that zeal in you by riding normal bikes. It will be great if your bike provides safety along with the big ride and it also looks luxurious. So, the main concern should be about which bike can offer all those common benefits along with safety and a few more factors which are related to bike riding. But it is difficult to find out the right one. Don’t worry we have a solution; we find Diamond Overdrive 29 Hardtail Mountain Bike that fulfills all requirements of rider. 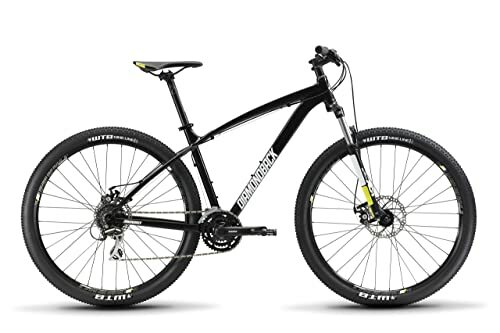 If you want to buy a mountain bike at a reasonable price or you want to test the ride efficiency and searching for the thrill while riding, then this bike is suitable for you. The 6061-T6 aluminum frame with 29-inch wheels is the backbone of this bike. It makes the bike more lightweight and strong that helps you to get a responsive ride as well. Nowadays mountain bikes are nearly all equipped with suspension. The purpose of suspension is to allow the rider with a smoother and more controlled ride. Diamond Override Bike has 80mm front suspension fork to keep you rolling confidently over obstacles. Besides that, the suspension system has 32mm stanchions, 15mm thru-axle, and turn-key lockout. The suspension fork takes the large portion of the rider’s weight. 3 SR Suntour XCT cranks are set in front, and the other 8 cranks are in the back for additional support while changing gears. They are built for smooth chain rolling. Shimano TX50 front derailleur can provide smooth, reliable shifting. Acera 8-speed rear derailleur offers a wide gear range to get you up and down the hills. These derailleurs also help for side swing. Shimano BR-315 hydraulic disks are used in the rear and front side of this bike. The front disk-brake is 180mm/w, and the rear is 160mm/w. This bike features Diamondback “Pro Bar” which is 740mm wide and 15mm rise to give you more control with more leverage at the time of riding. Before a mountain ride, you need to make sure that your bike can absorb shock and can provide better traction to enhance your riding performance. However, we find Diamondback Overdrive 29 mountain bike is perfect for the beginners who are preparing to go for their first mountain ride. This bike features almost everything that a rider needs. You will be amazed when you compare this bike with other standard mountain bikes. Because of its rigid frame with shock-absorbing suspension, you will be secured even in the rough terrain.